Route: 1925m=6315' ascent; 13 miles; 8.5-10.25 hrs. 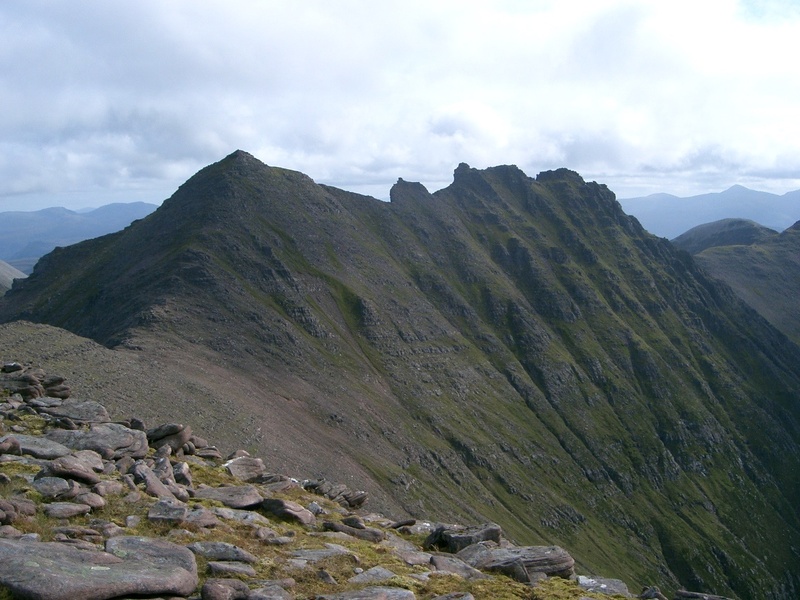 Route: The ridge from Sgurr Fiona to the col SE of Corrag Bhuidhe is narrow and exposed with pinnacles that require only minor scrambling (<½ mile long) if the correct route is taken. These pinnacles are easily ascended by taking lower horizontal paths on the west side of the ridge, and then taking short paths northeastwards up steep grassy slopes to each when level with them. Any difficulty indicates the wrong route, in which case take a lower path and/or leave ascending till further along the ridge. Otherwise, and apart from the steepness of the initial descent off Glas Mheall Mor, this traverse of An Teallach is straightforward. The Corrag Bhuidhe Buttress, with its deleted Munro Top, is the set of cliffs seen half way up the face of the end of the SE ridge of Sgurr Fiona when seen from Stob Cadha Gobhlach. The path up the buttress goes NW slightly diagonally leftwards from the col at NH06708291 up to another col at NH06538312, just behind the left end of the buttress cliffs. To visit the deleted top, simply go about 100m E from the col along the ridge to the top. The ascent of the ridge continues from the col by going up just to the right of the crest for a few metres only. When the path crosses back to the crest, which is at the bottom of a row of cliffs, stop ascending and take the horizontal path on the left, thereby avoiding any scrambling. (You should see another horizontal path below, which is to be ignored.) Follow the horizontal path NNW passed the first grassy gully and round a buttress (below the southernmost of the three tops of Corrag Bhuidhe) to the next much broader grassy slope which stretches up between the cliffs as far as the ridge crest. Ascend a fairly steep, faint path up the slope to a slight dip in the ridge. To visit the above-mentioned top, turn right and go south along the ridge for a few yards of very easy scrambling. 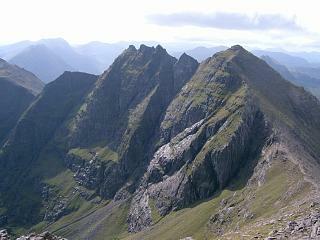 The rest of Corrag Bhuidhe can be completed by some easy scrambling northwards along the crest. 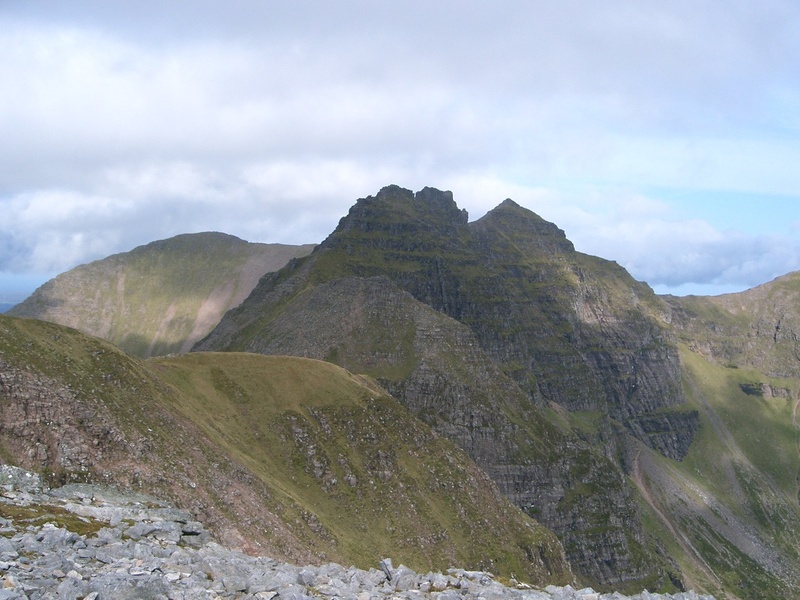 However, it is much easier to turn left from the dip in the ridge at the top of the grassy slope and take another, higher, horizontal path NNW round the buttress below the midddle top of Corrag Bhuidhe as far as the point where the path has to descend. There is one rather exposed but easy move in this section, which is when rounding the buttress. The end of the horizontal path is immediately west of the northernmost Munro top of Corrag Bhuidhe, its highest point, which is now just a few metres above and easily attained. 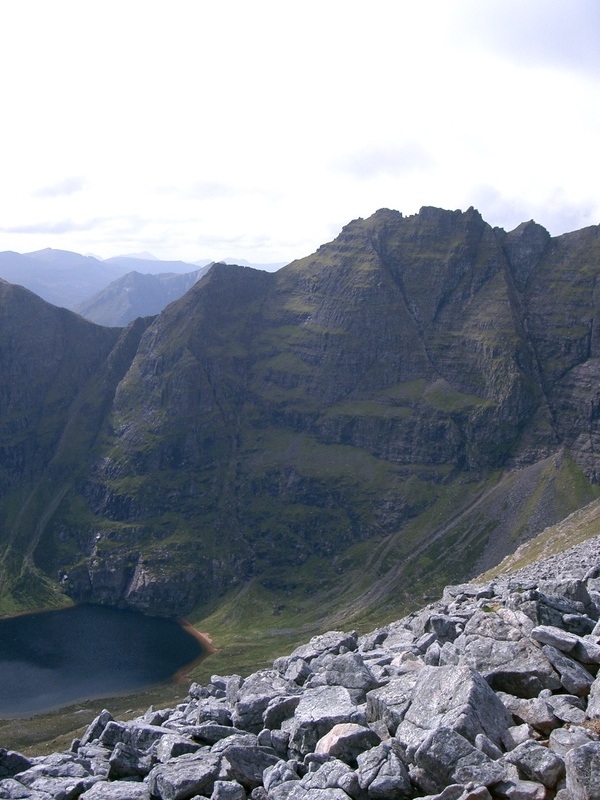 The ridge is completed easily by a descent NNW from the north top of Corrag Bhuidhe to a col, an easy scramble NNW up the ridge to Lord Berkeley's Seat, down to the next col, and then up to the cairn on Sgurr Fiona. 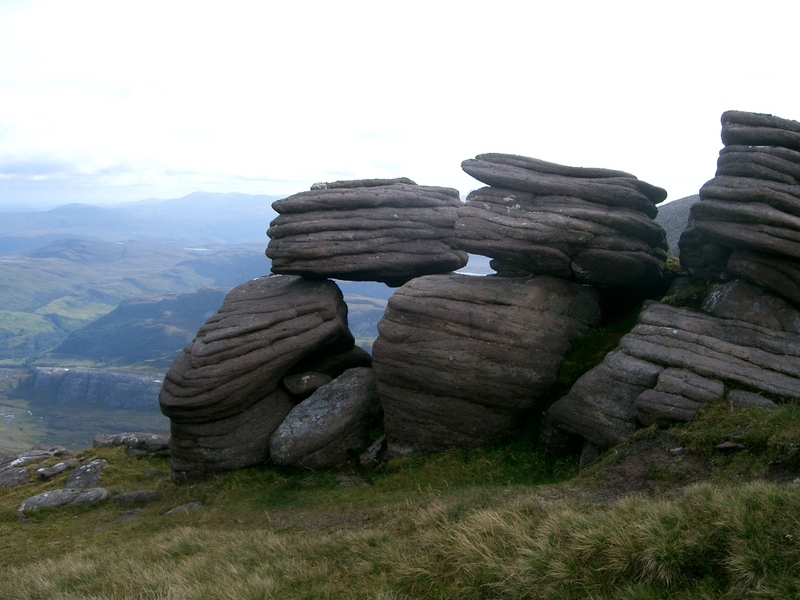 The actual summit block of Lord Berkeley's Seat can be avoided, but it is easily reached with a short, trivial scramble up its SE side. The route from Sgurr Creag an Eich over to Bidein a' Ghlas Thuill makes use of a shortcut which traverses the north face of Sgurr Fiona between the two cols. This avoids re-visiting the summit of Sgurr Fiona. There are a number of bits of paths here, and some rocks to go above or below, but it is entirely straight-forward. 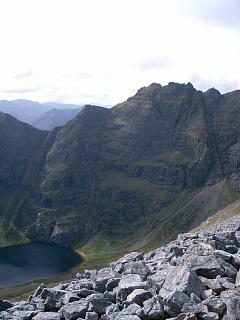 The standard route to the two Munros is from Dundonnell via the col to the north of Bidein a' Ghlas Thuill. 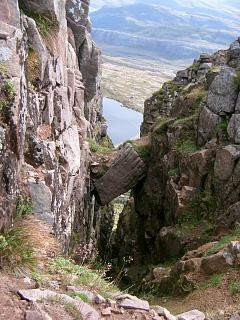 This would be one way of descending, but entails a 2½ mile walk back along the A832 to Corrie Hallie. Alternatively, and much shorter, one can descend SE from this col into Glas Tholl and cross ENE to pick up the path at the scenic waterfall, or descend the steep grass and heather slopes on the east face of Glas Mheall Mor and again head for the waterfall. Walking poles are particularly useful for both of these latter two choices. The Allt Coir' a' Ghiubhsachain is tricky to cross but, having done so, it is fastest to go over the low ridge and head directly for the A832 at the point where the house, Corrie Hallie, is. At this point of the road there is a gate in the fence and the trees and ditch are avoided. Preferably choose good weather for visibility, view & to avoid slippery exposed slopes. The times below reflect time wasted in finding a route to the first pinnacle of Corrag Bhuidhe. Access: Park in layby on A832 near Corrie Hallie house, 2½ miles S of Dundonnell. There is space for a dozen cars on E side of road between the house and the track gate. Weather 5/9/04: Dry & dull with sunny intervals. 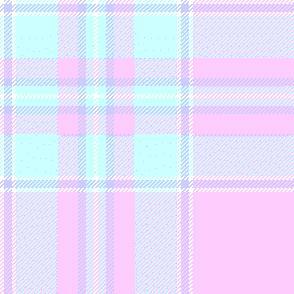 Weather 10/8/09: 5°C at car initially; in cloud from start to 1600; some showers. 5/9/04 10/8/09 Description Alt. Asc. Dist. Mob. 1525 1600 Descend due SE down gully into Glas Tholl.